Torrence, whose focus was on creativity, developed the Torrence Incubation Model of Creative Thinking (TIM) model. As emphasized in this video, embedding creativity into the curriculum can and should be a strong component of content area teaching and learning. In other words, educators don’t need to plan to teach creativity as another part of curriculum. Creativity is often an integral part of the practices of professionals including scientists, mathematicians, business people, artists, writers, and is an important part of their content area expertise. It follow, then, that learners should be taught in ways that help them think like a scientist . . . like an artist . . . like a writer . . . like a business person. Showing an engaging video and then having a discussion about it. Telling a story, using comics or humor. (For more about the use of stories, see Storytelling Is Not Lecturing; Lecturing is Not Storytelling). Presenting a challenge or problem. Using an online tool like Padlet or Flipgrid to propose open-ended questions. Having learners play an analog or video game; or online interactive. For STEM examples, see http://www.pearltrees.com/jackiegerstein/online-stem-interactives/id18098228. Increased engagement in and motivation for the learning activities. Increased interest in content area learning; possibly stimulating new learner passions. More generalizable skills related to creativity. So just with a little planning, the educator can set up conditions that can significantly motivate learners and create an energized learning environment climate. I was painfully bored during my K-12 education. I looked forward to college anticipating that it would be different – more engaging, more interesting, more innovative. I was wrong. My undergraduate education, except for a few bright spots, was just an extension of my K-12 education including more grill and drill with sages on the stages (literally since I went to such a large university); taking notes and taking lots of multiple choice tests. During my freshman year, I thought that if I had one wish, it would be to change the educational system (which has stayed with me ever since). One of those bright spots was being asked to read Carl Rogers, Freedom to Learn, which was published 1969 in an upper level Educational Psychology course. The big aha for me was that school systems should be focused on helping learners develop the skills for how to learn not what to learn, one that was sorely lacking in most of my K-graduate-level education and a concept and goal that as an educator I’ve held onto ever since. So now when I read about new “pedagogies” and instructional strategies based on self-directed learning, learning how to learn, self-determined learning, I kind of laugh to myself. Solid, valid, and student-focused pedagogy has been proposed ever since the beginnings of institutionalized education – think John Dewey, Maria Montessori, Kurt Hahn, and in this case, Carl Rogers. The following text provides a summary of Rogers’ major themes about learning and education from Freedom to Learn and comes from Weibell, C. J. (2011). Principles of learning: 7 principles to guide personalized, student-centered learning in the technology-enhanced, blended learning environment. Retrieved from https://principlesoflearning.wordpress.com. It has a quality of personal involvement – Significant learning has a quality of personal involvement in which “the whole person in both his feeling and cognitive aspects [is] in the learning event” (p. 5). It is self-initiated – “Even when the impetus or stimulus comes from the outside, the sense of discovery, of reaching out, of grasping and comprehending, comes from within” (p. 5). It is pervasive – Significant learning “makes a difference in the behavior, the attitudes, perhaps even the personality of the learner” (p. 5). It is evaluated by the learner – The learner knows “whether it is meeting his need, whether it leads toward what he wants to know, whether it illuminates the dark area of ignorance he is experiencing” (p. 5). Its essence is meaning – “When such learning takes place, the element of meaning to the learner is built into the whole experience” (p. 5). As an example of significant learning—the kind that illustrates his theory of freedom to learn—Rogers cited the informal notes kept by Barbara J. Shiel, a teacher, who out of despair and frustration decided to try a drastic experiment in promoting experiential learning in her sixth grade class. In the experiment Mrs. Shiel introduced the concept of work contracts. These were ditto sheets that contained a list of all of the subjects the class was to study, along with a list of suggestions for study under each, and a space for students to write their plans in each area. Human beings have a natural potentiality for learning. “They are curious about their world, until and unless this curiosity is blunted by their experience in our educational system” (p. 157). Significant learning takes place when the subject matter is perceived by the student as having relevance for his or her own purposes. “A somewhat more formal way of stating this is that a person learns significantly only those things which he perceives as being involved in the maintenance of or the enhancement of his own self” (p. 158). Independence, creativity, and self-reliance are all facilitated when self-criticism and self-evaluation are basic and evaluation by others is of secondary importance. If a child is to grow up to be independent and self reliant he must be given opportunities at an early age not only to make his own judgments and his own mistakes but to evaluate the consequences of these judgments and choices. (p. 163). The educator has much to do with setting the initial mood or climate of the class experience. “If his own basic philosophy is one of trust in the group and in the individuals who compose the group, then this point of view will be communicated in many subtle ways” (p. 164). The educator helps to elicit and clarify the purposes of the individuals in the class. The educator relies upon the desire of each student to implement those purposes which have meaning for him or her, as the motivational force behind significant learning. The educator endeavors to organize and make easily available the widest possible range of resources for learning. The educator regards him/herself as a flexible resource to be utilized by the group. In responding to expressions in the classroom group, the educator accepts both the intellectual content and the emotionalized attitudes, endeavoring to give each aspect the approximate degree of emphasis which it has for the individual or group. As the acceptant classroom climate becomes established, the educator is able increasingly to become a participant learner, a member of the group, expressing his views as those of one individual only. The educator takes the initiative in sharing him/herself with the group—his/her feelings as well as thoughts—in ways which do not demand nor impose but represent simply a personal sharing which students may take or leave. As a facilitator of learning, the educator endeavors to recognize and accept his/her own limitations. “S/he realizes that s/he can only grant freedom to his/her students to the extent that s/he is comfortable in giving such freedom” (p. 166). The following graphic developed by the Freedom to Learn Project, is based on Rogers’ ideas and exemplifies their manifesto. So the push towards self-directed learning – helping learners develop skills for directing their own learning really isn’t new BUT the Internet, social media, and open-source content just make it easier for the educator actually implement these practices especially when working with groups of students. As a preface to this post, my belief is that deep learning does not occur through sit and get. Deep learning occurs through experiential, authentic, interactive, collaborative instructional processes. If deep learning is desired for teacher professional development, then it should reflect best practices for teaching and learning. Teachers need time to tinker, play, and experiment with instructional materials and resources especially with new forms of teaching/learning technologies. For skills development, such as using new technologies, scaffolding and increasing complexity should be a strong component of the PD process. Teachers need to be offered lots of instructional suggestions and resources so they can tailor their PD learning to their own teaching environments. Intentional and active reflection and goal setting should be included to increase the chances of transfer of learning. Teachers, during PD, should be provided with time, resources, and materials with which to play. It sets the expectation that they will be active agents of their own learning. It gives them the message it is okay to play and experiment with the materials; that tinkering is often needed as a part of learning new skills. Once teachers get familiar with instructional materials and resources through tinkering, they should be guided through a series of skills that are increasingly complex; that honor the process of scaffolding. As with tinkering, this should be a hands-on process where teachers can try out these skills with facilitator and colleague support and guidance. As confidence is built through success with basic skills and strategies, more complex skills and strategies will be more welcomed by teachers. Even with fairly homogeneous groups of teachers, their teaching and learning needs can be vastly different. They often teach different groups of students, different grades, different content areas. They often have different backgrounds, years of experience, and personal and professional interests. As such, they should be provided with lots of instructional strategies and resources to help them make direct connections to their own teaching environments. Given the plethora and free resources that can be found online, curated aggregates of resources can be provided to the teachers. Time should be allotted during the PD training for them to examine and discuss these resources with their colleagues. Facilitators of teacher professional development need to be more intentional to include specific strategies to help insure that learning is transferred in teachers’ educational environments. Reflection and goal setting, two powerful transfer of learning strategies, should be built into teacher professional development. Because of on my request, my district gifted education supervisor purchased 3 sets/3 dozen Spheros. As a follow-up, he asked me to facilitate a teacher professional development workshop on their use. We construct grammatically correct sentences or correct our mistakes by intuitively applying the rules that govern English syntax. If, instead, we had to apply those rules consciously, they would only get in our way, making it impossible for us to speak or write at all. To construct a simple two-word sentence, such as “He dreams,” requires the application of at least seven grammar rules. Imagine trying to apply them consciously following the rules of English grammar. Over the years, the teaching of grammar has continued to be prominent in English and foreign language instruction, leaving less class time or student energy for students to speak, read, or write in those languages. As early as 1906, studies were undertaken that attempted to show the relationship between knowledge of school-taught grammar and language skills. Since then, hundreds of such studies have produced some clear and unequivocal conclusions: The teaching of formal grammar does not help a student’s ability to speak, to write, to think, or to learn languages. With regard to our substantive case of grammar, the current evidence from randomised controlled trials does not support the widespread use of grammar teaching for improving writing among native English-speaking children. Based on the experimental trial and meta-analysis evidence about writing teaching more generally, our hypotheses are that supporting primary/elementary pupils’ grammar is most likely to require teachers intervening during the writing process, and interacting to discuss the use of grammar in relation to the overall purpose of the writing task and the purpose of the writing. Small-group and whole-class teaching that includes a focus on the actual use of grammar in real examples of writing (including professionally produced pieces, realistic examples produced by teachers including ‘think aloud’ live drafting of text and drafts of pupils’ writing) may be more effective. 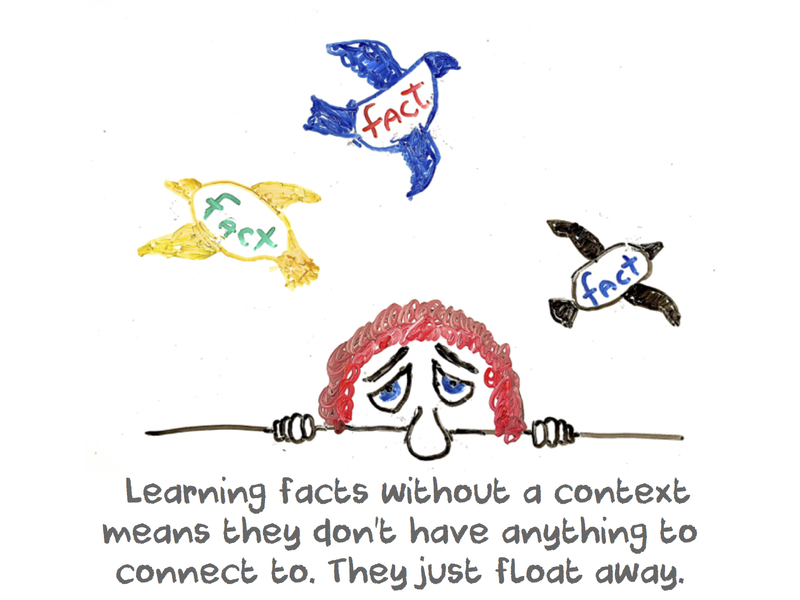 I often discuss and blog about teaching content within a context, that learning needs a context. . .
How often have students been asked to memorize mass amounts of facts – historical dates, vocabulary words, science facts; get tested on them, just to forget almost all those memorized facts a week or two later? Given that is this learning experience is more common than not, why do educators insist on continuing this archaic and ineffective instructional practice? The visual image I use to describe this is that there are all of these unconnected facts floating around in the learner’s brain. Since they have nothing to connect to, they end up flying away. This is especially true for abstract concepts including memorizing grammar rules. The key to increased understanding is providing a context for the facts and the rules. 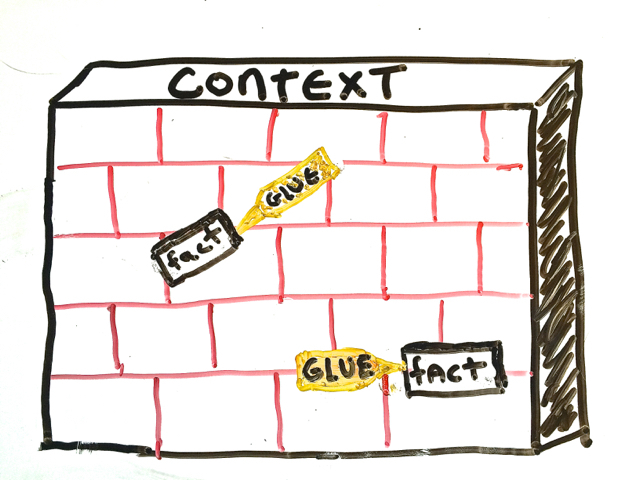 The context becomes the glue to increase the stickiness, the longevity of long term memory of those facts and rules. This is especially true for abstract concepts such as grammar rules. These concepts need something concrete with which to attach. Is that the correct verb for that noun? What tense should that verb be? What type of punctuation in the different pauses? Is that possessive? If so, what is the punctuation?
. . . and again, these questions and the suggested edits are done in the context of the individual learners’ blog posts that have already been composed. Learners eagerly volunteer to have their blog posts reviewed. First, they really enjoy having their posts read out loud. Second, I believe this is also due to the focus being on improving their means to communicate better not for a grade. The learners know that their blogs are viewed by their own classmates and their sister school (I teach gifted education at two schools and have opened my Kidblog to both schools to view one another’s posts). They have authentic audiences and what to present their best selves. As it becomes a group exercise, the other class members seem to enjoy the challenge and become engaged in offering corrections and improvements. To keep up the motivation and make it manageable, I only do 2 or 3 during any giving sitting. Update: This is the second year that I am continuing this practice with my gifted elementary learners. I have a student who dislikes the hands-on activities I do in my class. Since I do so many of them, I often struggle to find ways to engage him. One of his strengths is writing and grammar. I’ve made him the “official” grammar coach helping the other learners edit their blog posts. When he is doing so, he definitely finds his stride; a purpose in my class. Not perfect, but better, and I believe they both learned from the process. How Do We Learn? How Should We Learn? If I ask you or your students, “How do you learn,” how many of you could clearly articulate this process? If you can, are the strategies you’re using the best ones for learning? Furthermore, if the research on the process of learning is compared to the practices being implemented in school, does this research influence school practices? During my school years, I noticed there was a problem with how I was being asked to learn. Cramming and memorizing information, being tested for mastery prior to having enough practice time, having units of study with supposedly beginnings and endings, and learning facts with no context were counterproductive and at times, painful to me. The unintended consequences of these artificial and unnatural ways of learning include believing that learning is or should be difficult, painful, disciplined, and not fun. This, too often, results in learners believing that they cannot or do not want to learn new things especially in those areas where and when learning was painful. I believe learning can or should be natural, fun, engaging. Instead of making assumptions about the best and most natural learning strategies, it is best to research and study this process. “Unfortunately, most people, educators included, are unaware of the lessons from the science of learning” (http://blogs.kqed.org/mindshift/2014/08/how-does-the-brain-learn-best-smart-studying-strategies/). What follows are some of those strategies that research has indicated are some of the better ones. It obviously is not extensive nor inclusive of all possible learning strategies, but it is a good start to reflect on how educators ask students to learn. The more you can apply what you’re learning to your every day, the more it’ll stick in your head. The reason is simple. When you’re learning by doing, you’re implementing everything that makes our memory work. When you’re able to connect what you’re learning with a real world task, that forms the bonds in your brain, and subsequently the skills you’re learning will stick around. 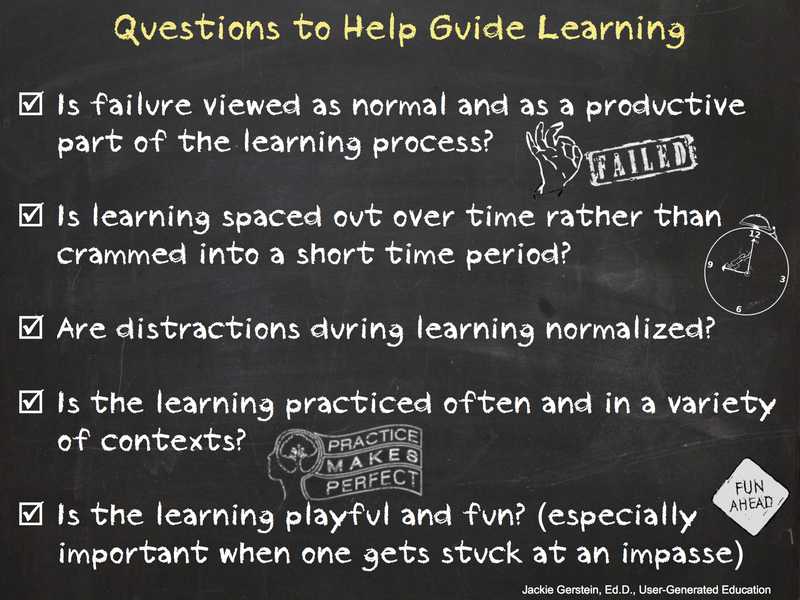 Is failure viewed as normal and as a productive part of the learning process? Is learning spaced out over time rather than crammed into a short time period? Are distractions during learning normalized? Is the learning practiced often and in a variety of contexts? Is learning playful and fun? This is especially important when 0ne gets “stuck” at an impasse.